The Meals on Wheels Singing Santa’s have become a household name in Wicklow. For over thirty years they have been gracing the pubs in Wicklow town and singing in the street, dressed in their very festive gear. The group is made up of musicians and local characters of great standing in the community. 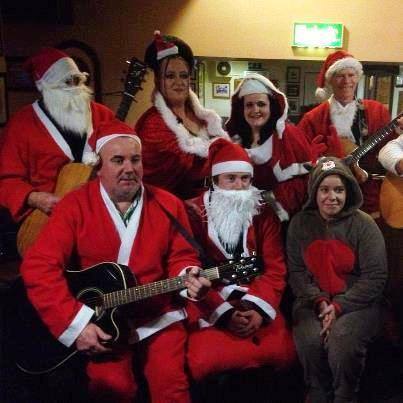 This year we have The very popular Wicklow Band Tell No Fox ..joining the Singing Santa team. The band of Santa’s start off in the Leitrim lounge singing Christmas songs, then make their way to all the pubs in the town. It takes around one hour to complete, and in that time up to 1700 euro has been collected. We have a Mrs Santa and an Elf in the team. Our last port of call is Ta Se pub in the market square. The money is counted by the team on the night, and the amount announced. Meals on Wheels is a wonderful service, run by wonderful people. They give their time to this cause free of charge. Rose Behan the Chairperson receives the money on behalf of the Wicklow branch.